When disasters strike, news stations explode with coverage while many organizations, including Samaritan’s Purse, quickly arrive on the scene to help. But as time passes, the newscasts quiet down. After helping meet emergency needs and cleaning up debris, the volunteers leave. But for many homeowners who have had their entire lives turned upside down, the pain remains fresh—especially when they don’t have a roof over their heads. 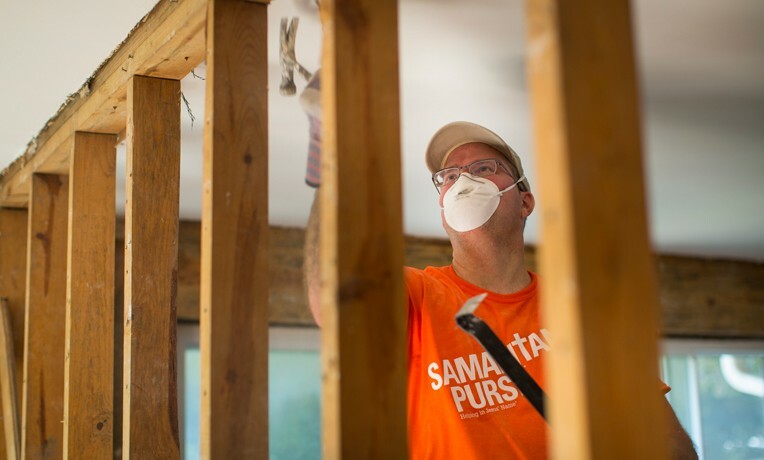 SERVE WITH US: See the current opportunities to volunteer with Samaritan’s Purse in the U.S. and around the world. That is why Samaritan’s Purse often stays behind after the initial, emergency phase of a disaster response is over. When the need arises, we’ll establish a rebuild project so we can bless some who’ve lost nearly everything with a new home—free of charge. For many homeowners, such a gift seems almost unbelievable. That’s what Will Hopkins thought. His house was badly damaged by a tornado that hit central Oklahoma in May two years ago. Will was trying to make repairs himself, working on his home from paycheck to paycheck so his young family could move back in. 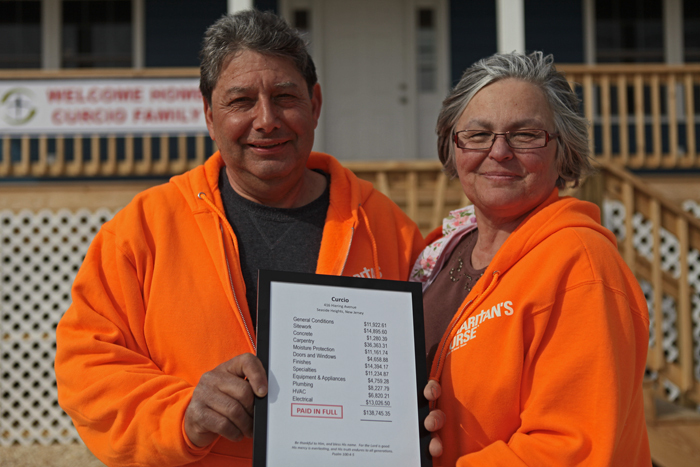 The Hopkins family was grateful to move into their new home. When he was invited to apply for the rebuild program and then accepted, he said Samaritan’s Purse was an answer to prayer. He broke down in tears when he heard the news we would be repairing the rest of his house at no cost to him. For years, Samaritan’s Purse has helped families like Will’s get back into their homes. In 2014, we operated rebuild and reconstruction programs in Alaska, New Jersey, New York, and Oklahoma. We are still working in Oklahoma and New York, and recently opened new sites in Mississippi and Arkansas, where we responded to tornadoes last year. Houses in New York had to be built off the ground to protect against future flooding. The rebuilds in both New Jersey and New York posed new challenges. 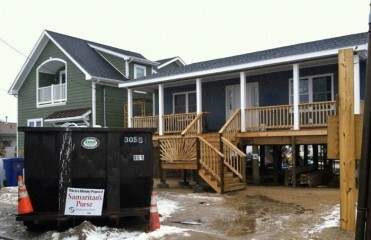 Due to the severity of flooding following Hurricane Sandy in 2012, houses had to be raised off the ground. Otherwise, homeowners would be denied insurance. Determined to help homeowners with nowhere else to turn, we did not shy away from the increased difficulty, cost, and time requirements and pushed ahead with the rebuilds. Dianne Gahagan, the office manager and volunteer coordinator for the site in Nassau County, New York, said that while hurricane victims have been exceptionally grateful for their new homes, Samaritan’s Purse has done more than build houses. We’ve cultivated genuine relationships while showing the love of Christ, becoming a welcome part of the community. 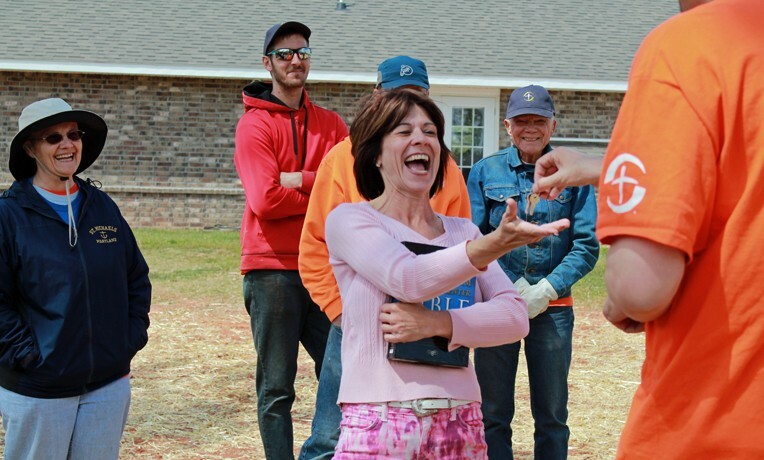 Through the rebuild projects, many have come to Christ, even in the Lowe’s parking lot while buying supplies, Dianne said. When storm victims move into their new house, they get a “paid in full” certificate reminding them of all that Jesus accomplished when He went to the cross as a sacrifice for sins. Reducing anxiety is a big priority for our rebuild ministry. 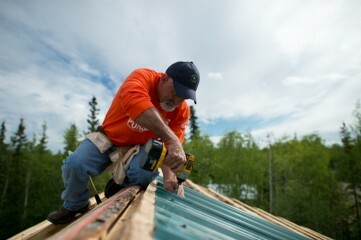 Just like the storm shelters gave a sense of security to many in Oklahoma, our work in Galena, Alaska, brought peace of mind after a flood destroyed many homes in the 400-resident village. While many people were given home kits by the government, rebuilding would take a lot of time and effort—especially with the nearest home improvement store around 300 miles away. Samaritan’s Purse volunteers came in to help assemble the kits for homeowners who were struggling to find the time and additional resources. Samaritan’s Purse volunteers’ willingness to help made an impact on the people of Galena. 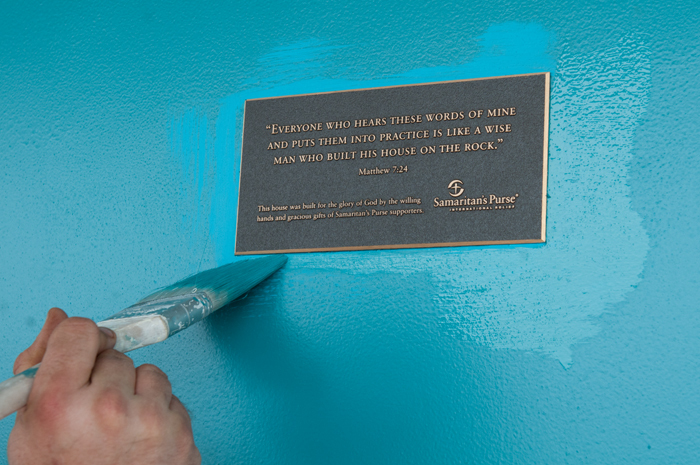 As our volunteers displayed Jesus’ love while working, the original iciness thawed to allow doors to open and God to work in the lives of homeowners. As we continue our rebuild projects in 2015, we’re opening two more sites: one in Winston County, Mississippi, and one in Faulkner County, Arkansas—two places struck by tornadoes last year. Every home includes a clear declaration that Jesus Christ is the foundation of our work. Our teams are already in these areas, showing compassion to homeowners running low on hope while giving the gift of a new home tailored for them.